The two most popular sizes of our two most popular cleaning and sanitizing products. Keeping your equipment cleaned and sanitized is the most important step toward making the best beer possible. 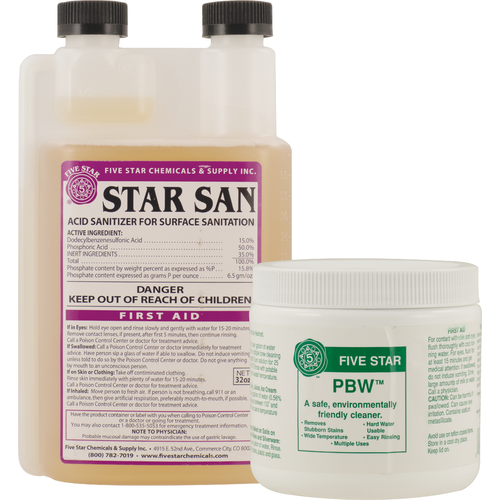 Stock up on PBW and Star San at the same time, and save a couple bucks along the way! PBW stands for Powder Brewery Wash, which is a non-hazardous buffered alkaline brewery cleaner. PBW is the cleaner of choice for many breweries, where it out performs more hazardous caustic chemicals without removing the flesh off your bones. PBW also will not corrode soft metals. Comes in a jar with screw top lid. As a high foamer, Star San's foaming action insures coverage and contact time in larger vessels and better penetration into nooks and crannys. Any foam that is left over in your carboy or keg from the Star San solution will not harm your beer or you, and is perfectly safe and non-toxic, nor will it impart any flavors or odors. If you plan on making some up for spray application it is best to use distilled or RO water to maximize the life of the unused portion (minerals in tap water reduce the shelf life of Star San once in solution).